The feeling of triumph one experiences after completing a project that continually slung difficulties your way is nothing short of euphoric. I could not stop prancing around my apartment last night after finishing my beaded cabochon necklace. Yes, prancing, dancing, and frolicking filled the latter part of my evening and part of this morning as I dressed for work. I went in and patched the holes caused by the combination of delicate base beads and the wrong thread. Things seem to be holding up well now that I used a less coarse option. Sometime in the middle of the project, I decided that I wanted it to be an off-centered, asymmetrical piece. This presents the problem of balance. I heard my mother's warning echoing in my mind, "It's too heavy! It will just slide into the center." My solution was to add more strands on the longer side, keeping things in place. There are seven beaded strands, one amber, and three chains to the shorter side's six, one and one respectively. The extra bulk isn't so noticeable, though I'm haven't entirely made up my mind as to whether I want it to be. Nonetheless, it's stayed in place all day. 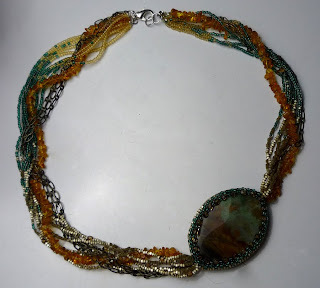 I saw a piece somewhere that had a gradient effect where the beads flowed in from one color to the next. I attempted it here, but it's hard to see and wasn't exactly successful. The colors weren't close enough in hue and tone, so going from champagne to turquoise to amber didn't quite get the effect I was after. 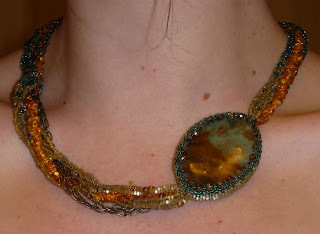 Mixing the strands with the chain and amber chips don't showcase the transition either. My poor thread choice came up again when I was finishing off the clasp. While threading it through the crimps, it shredded all over the place, in some cases leaving me only an inch or so of thread to work with. What a mess. One strand had to be entirely rethreaded, but the others finally cooperated after much prodding. I may stash the thread in some secret place for visiting little ones to use for crafts, but I surely won't be using it on any more projects. 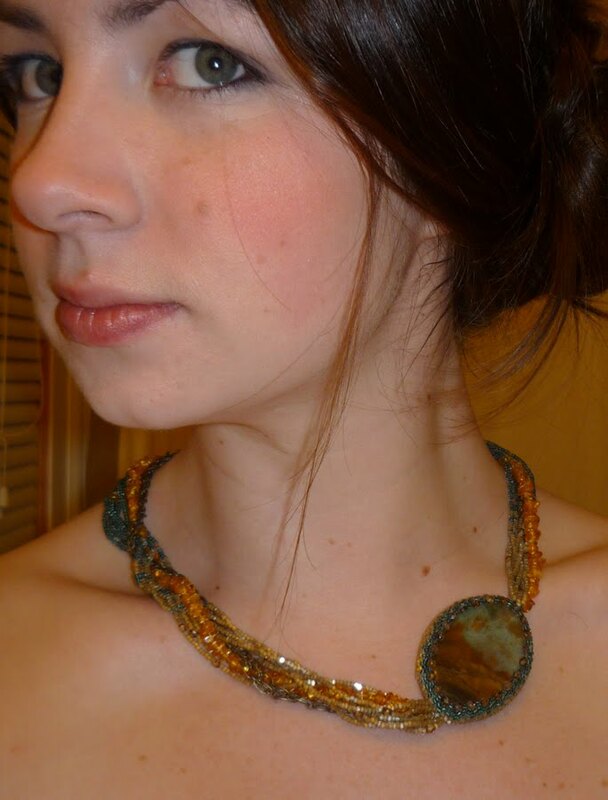 a beaded cabochon photo shoot. Another project crossed off the list! I have a slew of others in the works as well, including the use of the previously mentioned white silk. I'll share it with you in addition to some Anne Boleyn-centered musings during this month of her execution in 1536.
just breath taking-oh so is the jewelry!! !